Key control boxes for auto dealerships. If you run a dealership, you might know what it's like with keys lying all over the place. 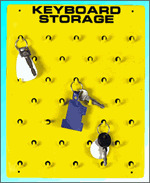 Keep your keys organized in these handy cabinets and boards for easy access.